Shoe with Blue Grapes - 2453 Discounts Apply ! 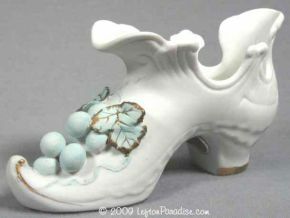 A decorative shoe with applied blue grapes and leaves. White bisque with glazed interior. It is 4¼ inches long and is marked 2453 with Lefton color crown logo and sticker. The piece has no flaws, but there is an inscription in pencil on the bottom that dates the shoe as a gift in August 1961.